Whether in a new curio cabinet or one handed down through the generations, showing off your collectibles means keeping the glass cleaned of dust and fingerprints. Glass shelves also require regular cleaning as dust settles on surfaces, detracting from your collections. Dust accumulates along glass edges and corners, requiring you to clean these sections thoroughly to keep dirt from becoming embedded between the glass and the wood. With the proper cleaning, your guests can gaze at your special keepsakes without looking through streaks or dust. Wipe the curio cabinet glass with a lint-free cloth. Remove items from the curio cabinet if sitting on glass shelves. Place a towel on the floor and lay removable glass shelves on top of it. Do not stack glass shelves on top of one another; lay side by side. Wipe dust from the shelves and the inside and outside glass of the curio cabinet doors with a clean, damp cloth. Dig deep into corners and along glass edges to remove hidden dirt. Spray the glass on the inside doors with a glass cleaner. Wipe the glass with a lint-free cloth. Spray the outside glass with the cleaner. Fold the cloth to reveal a dry side and wipe the cleaner from the windows. Look through both sides of the glass to check for streaks. Respray with the cleaner if you notice streaks or missed areas during cleaning. Hold one end of the glass shelf with one hand, leaving the bottom on the towel. Spray both sides with the glass cleaner. Wipe both sides of the shelf with a clean lint-free cloth. 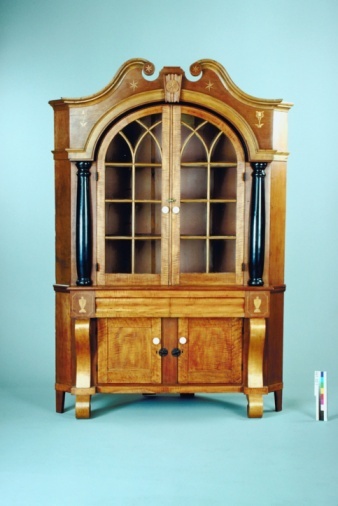 Examine for streaks before placing back into the curio cabinet. Place items carefully back onto shelves.